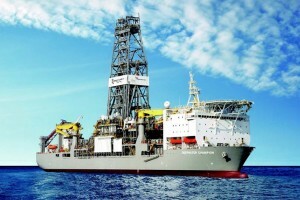 The Exxon Mobil rig in Guyana’s waters. GEORGETOWN – American oil giant Exxon Mobil Corporation is moving full steam ahead with plans to transform Guyana into a major oil producer. In what industry experts call a rare occurrence in the industry, Exxon Mobil has asked the David Granger administration for a production licence to start pumping oil from the country’s seabed, less than five years after it discovered major oil finds. Guyana Geology and Mines Commissioner Newell Dennison yesterday confirmed the application to the Associated Press, saying it would be the first time the small South American country has issued an oil and gas licence. Last year, Exxon Mobil announced the successful drilling of a deep water exploration well that it said positioned the Guyana seafloor as one of the richest oil and natural gas discoveries in decades. The company estimated that one of its offshore fields, known as Liza, could contain 1.4 billion barrels of oils mixed with natural gas. Dennison said the company has also submitted its general production plan alongside its application for a production permit. The firm has so far drilled five wells and is currently completing work on a sixth. Only one has come up dry so far. “I can confirm that they have applied for the permit,” Dennison revealed, saying it would allow operations by late 2019. Minister of Natural Resources Raphael Trotman has said that government is planning to contract international firms to help it in negotiations with Exxon Mobil because the country has no expertise in this area. He did not identify any of the firms. Just last Friday, the government appointed Dr Jan Mangal, an expert in offshore and civil engineering, as the country’s petroleum advisor in the Ministry of the Presidency. His first task will be to engage with officials of Exxon Mobil to get a full understanding of their development plans. Dr Mangal said he will be looking at the issue of energy generation in a holistic manner in keeping with the country’s “green agenda”. “It’s not only the power sector and the green agenda, but it’s also about infrastructure, the revenue from the petroleum and the needs of the sector as whole…The power sector in Guyana also needs to be looked at in terms of how natural gas can be used instead of diesel or whatever is being used right now,” he explained.